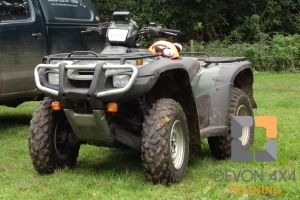 Our quad bike training courses in Devon and across the South West are designed for professional Sit-Astride ATV operators and provide clients with full reporting, including the Lantra-Awards Quad Bike Certificate. We can either visit your operators in the workplace, using the machines they will be working with, ensuring their familiarisation with their quad bikes, or train them at our Lantra-Awards approved venue. Training two novice operators or assessing up to four experienced operators in a day, we can ensure that the training has a minimal impact on your timescales. Designed to assist your PUWER compliance, this course covers all the elements recommended by the HSE (see the HSE Agricultural Information Sheet for ATVs – AIS33) and is recognised by government, industry, military and most major landowners. Costs will vary from £300-£600 for a day of training with certificate costs of £35/candidate. select and use appropriate P.P.E.